Fernandez and Wells in their own three words "Coffee, Cake and Chocolate". Housed at number 73, this cheeky little venue does Beak Street proud. Serving truly excellent coffee.... crafted by truly skilled baristas. A short but oh so sweet coffee menu in chalk hangs above the counter. Order a stumpy or a flattie .... you can't go far wrong. Modern, slick and uncluttered design - wooden block tables, metal stools and a food laden counter as the centrepiece. Not somewhere to get cosy and hibernate with a magazine all afternoon, but certainly a venue to go for a chat and a good coffee or a spot of Soho people gazing. The food here is great too - the sandwiches and cakes are awesome.... if a little on the pricey side of life. But a small price to pay for greatness. If there are no seats to be had, you can always grab a take-away and stroll around the streets of Soho or nearby Carnaby Street. It could be worse. 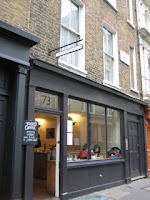 Or maybe stop by their newly opened counter-part round the corner in St Annes Court, Soho. This place is equally cool. 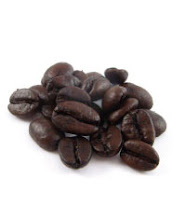 *NEWS* Fernandez and Wells are now serving Has Bean coffee courtesy of Steve Leighton. A great move by F+W. The coffee is now even more awesome!